Not tall enough to see over your fence? Searching for an advanced drone with GPS flight, but want it to be easy to fly and be under 500 dollars? Now, with the ultra modern easy to fly remote control quadcopter helicopter drone with camera holder you are in command. Perfect for beginner to advanced remote control drone pilots. Measures almost 1 foot long. Check out the video below. Control with the included long range 1000 feet remote control transmitter or input GPS coordinates and flight paths. Flies over 1000 feet high! Out of battery or range? Do not worry as the automatic auto return feature will bring your new drone safely home to you. Comes with 4 main rotors for improved movement and increased stability can fly forward, up, down, left, right, backwards, bank left, bank right, and hover. Dual fly modes for quick flying/slow flying, and picture/video mode. Control the optional camera via wifi and free downloadable app that is in the instructions. Constructed of lightweight and extremely sturdy materials. The built in gyroscope makes for a very stable flight which is key when taking pictures or videos. 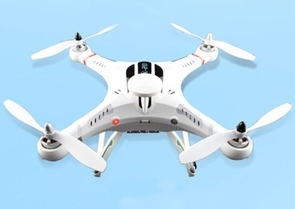 Buy 2 or more GPS Drone RC Quadcopters and we will send separate operating frequencies for the remote controls. The included rechargeable lithium polymer battery pack and charger which can achieve flight times of around 15-20 minutes. Comes fully assembled and ready to fly. Great for ages 12 and up.